Luxury accommodation with stunning views of the Bay. Check for the best room rates and book online. See other hotels in Port Stephens. Heralded as the best resort location in Nelsons Bay, Wentworth Landmark Resort offers affordable and self-contained accommodation that are complimented with stunning views. 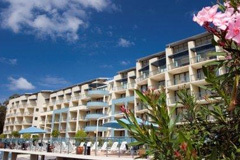 The Wentworth Landmark Resort is ideally situated, overlooking the picturesque Port Stephens area. Located beside the picturesque 27-hole Nelson Bay Golf Course, Bowling and Recreation Club and Tennis Club. The accommodation features well appointed one and two bedroom standard and executive apartments also available are studio style (hotel) accommodation with kitchenette and balcony with views over Port Stephens. Disabled access facilities are available on request. The air-conditioned apartments are well-equipped and come with a host of modern amenities. Lap it up in the pool or relax in the Jacuzzi, there’s just so much to do at the Wentworth Landmark Resort. Dine at the Port of Call Restaurant and indulge in their sumptuous and legendary seafood platter or just enjoy a coffee or afternoon tea. Guests can walk a few minutes to be in the heart of Nelson Bay, to shop and dine to their hearts content or enjoy a dolphin watch cruise. Landmark Hotel Nelson Bay is situated in a beautiful area where you wake up each morning to the sounds of birds in the forest behind and a beautiful bay vista.